This large-cap gold mining company and two underrated gold stocks could steal the show in 2019. Gold's appeal as a safe-haven asset back in the limelight, thanks to the volatility across global markets, triggered largely by trade tensions between the U.S. and China. Evidence lies in gold prices, which have gained steady ground in the past couple of months or so after a painful start to the year. The environment bodes well for gold mining companies that have intently focused on boosting productivity and cost efficiency in recent times. While it's difficult to predict where gold prices are headed, turbulence in the stock market and widespread fears of an economic slowdown in 2019 make it an opportune time for investors to consider adding gold stocks to their portfolio. Barrick Gold (NYSE:GOLD), Kirkland Lake Gold (NYSE:KL), and SSR Mining (NASDAQ:SSRM) are three top gold mining stocks you might want to consider for 2019. Here's why. 2018 would've gone down as yet another painful year for Barrick Gold shares if not for its recent move to acquire Randgold Resources (NASDAQ:GOLD). During the nine months ended Sept. 30, 2018, Barrick's revenue declined 13% and adjusted net income slumped nearly 45%, year over year. All-in-sustaining cost -- or AISC, a comprehensive cost measure used in the gold industry -- rose to $813 per ounce of gold from $750 an ounce in the year-ago period. Barrick's full-year production guidance downgrade earlier in the year didn't sit well with the market, either: It expects to produce 4.5 million-5 million ounces versus 5.32 million ounces in 2017. Though the fall is largely because of a stake sale in its Veladero mine, the market still sent Barrick shares crashing to 52-week lows in September before backing up the truck again on a surprisingly big news. 2019 should be an interesting year for investors in gold mining stocks. Image source: Getty Images. Barrick is acquiring Randgold Resources to create the world's largest publicly listed gold mining company. By Barrick's own estimates, the new company, expected to trade under ticker GOLD, will own five of the world's top 10 tier 1 gold mines (tier 1 mining assets are typically large, low-cost mines with a long life-span) and will be the largest gold producer, based on Barrick's and Randgold's combined 2017 gold production of roughly 6.5 million ounces. Asset sales and cost reduction: Randgold's CEO Mark Bristow, who will take over as the CEO of the combined company, is looking to sell noncore assets and cut costs. Stronger balance sheet: Barrick should continue paring down debt. As of Sept. 30, nearly 85% of its long-term debt wasn't due for maturity before 2032. Randgold carries no long-term debt. Higher dividends: Barrick's annual dividend of $0.16 per share for 2018 represents a 33% jump from 2017. Management aims to grow dividends further as cash flow rises. Progress in Tanzania: Bristow is keen to fix the long-pending tax disputes that have stalled operations at Tanzania-based Acacia Mining, in which Barrick owns 64% stake. In short, Barrick is in a transformational phase, one that makes the stock an interesting buy at this juncture. One of the lesser-known gold mining companies with four producing mines in Canada and Australia, Kirkland Gold is growing at an astounding pace. Data source: Kirkland Lake Gold. Chart by author. After ending fiscal 2017 with record gold production of 596,405 ounces, thanks to a 74% jump in production from its Fosterville mine in Australia and higher production from all mines, Kirkland has even bigger plans for 2019 and beyond. Kirkland is targeting 10% to 15% annual growth in production over the next three years and hopes to hit 1 million ounces by 2021, with half of it coming from Fosterville. Its AISC, meanwhile, is expected to drop from $930 per ounce of gold sold in 2016 to $735-$760 an ounce in FY 2018 and only $630-$680 per ounce in FY 2019. Rising production and declining costs make for a formidable combination for any mining company. KL Net Income (TTM) data by YCharts. Also, I expect Kirkland's capital expenditures to peak in 2019 and taper from there as it wraps up major expansion programs. That should mean greater free cash flows, part of which will likely go to shareholders in the form of higher dividends. Kirkland has already increased its dividends twice since it started paying out a quarterly dividend from mid-2017. Overall, Kirkland appears to be on solid footing, which is why I expect the stock to continue commanding a premium over mid-tier mining peers in the near term. SSR Mining stock finally seems to be breaking out after trading within a narrow range for nearly two and a half years. There are solid reasons why the market is getting increasingly bullish about the Canada-based mining company with three operating mines, one each in Nevada, Saskatchewan, and Argentina: its future plans. In recent years, SSR Mining's gold equivalent production has decelerated but is on the verge of a turnaround, with the miner projecting its gold equivalent production to grow 41% by 2021 thanks primarily to its flagship mine, Marigold in Nevada. 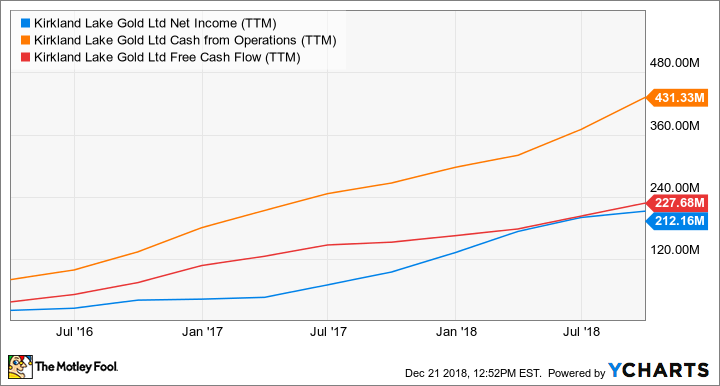 SSRM Free Cash Flow (TTM) data by YCharts. In June 2018, SSR Mining updated the life-span of Marigold mine through 2027 and projected production to jump 30% from 2017 to 265,000 ounces in 2021 and 2022 each. Meanwhile, production from the company's Seabee mine in Canada has risen steadily since 2014, creating a fresh record with each passing year (note that SSR Mining acquired this mine in 2016). By 2020, production from Seabee is expected to jump nearly 40% and cash cost to dip nearly 26% to $442 per ounce of gold. SSR Mining's Chinchillas project in Argentina also has strong silver production visibility. In short, it's a story similar to Kirkland's: that of rising production and declining costs. 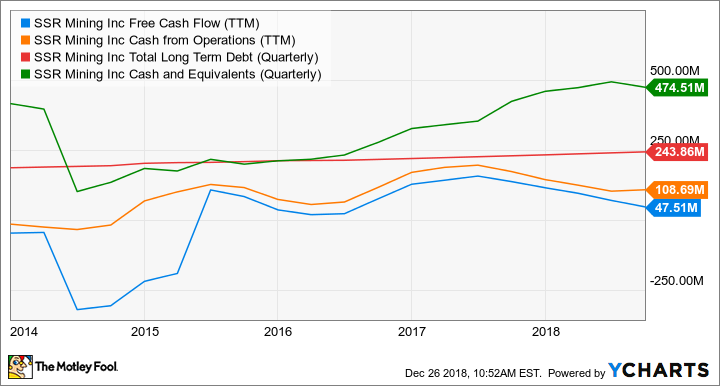 It also helps that SSR Mining has a pretty strong balance sheet, holding nearly twice the amount of long-term debt in cash and equivalents as of the last quarter as the chart above shows, and also generating positive free cash flows. SSR Mining has all the ingredients in place to take the next growth leap, making it a compelling gold stock to own right now.